Inkjet (Giclée) print is frequently referred to these days as pigment print because that is a more descriptive term. Inkjet (Giclée) printing applies the latest pigment based inks to premium substrates made of 100% acid-free cotton rag, or alpha cellulose. Specifically designed for photo and graphic printing, pigment inks enable professional labs to output superb-quality prints that will resist fading for more than 200 years on a variety of media. 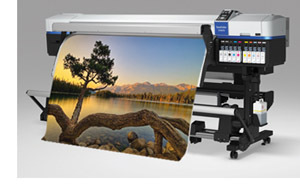 The process of inkjet (Giclée) printing is interpretive, creative and richly beautiful. Inkjet (Giclee) printing has very high color saturation and, with the added control afforded by digital imaging techniques, can produce prints equal to or greater than those produced from exposing film through traditional enlargers. Carefully formulated for durability, water resistance and excellent handling ability across a broad media set, including photo, watercolor, canvas, textured and fine arts papers, pigment inks offer a truly flexible solution for creative professionals. Inkjet (Giclée) printing is capable of achieving the ultimate in image fidelity while maintaining a quality and collectability standard. Hong Kong Imaging offers inkjet (Giclée) printing services to painters, photographers, and digital artists who generally make reproductions of their original two-dimensional artwork, photographs, or computer-generated art. Specially designed to produce an extensive palette of brilliant, life-like colors, deep, rich blacks and true, neutral grays, inkjet (Giclée) printing is perfect for portraits, landscapes, portfolio prints, and photos. These archival inkjet (Giclée) prints offer greater UV stability and increased longevity over chromogenic color prints and are readily accepted by museums, galleries, and collectors worldwide. Please select an option from the menu on the left for more information on our various printing services. If you have any questions, please don't hesitate to contact us for more information.